Welcome to another installment of Haunted America! Utah isn't generally known on a national level for its ghosts, but there are still plenty of wonderful legends and hauntings to go around...such as these stories from the Denver and Rio Grande Western Train Depot, located in Salt Lake City. 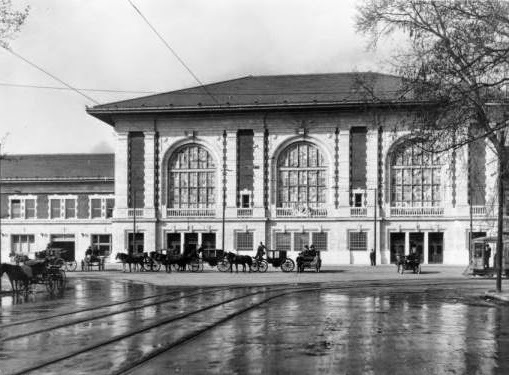 Commonly referred to as just the Rio Grande Train Depot, construction for this depot was completed in 1910 by architect Henry Schlacks, and for many years, was the main rail line in and out of Salt Lake City. In fact, it is noted that many celebrities came through this station, as well as scores of LDS missionaries, and even more soldiers on their way to and from Fort Douglas during WWI and WWII. However, as personal automobiles replaced the train as the preferred method of travel, the station's usefulness steadily declined. It did act as the area's Amtrak station from 1986 through 1999, but even then, its career as a train depot was nearly at an end. The building was put on the National Register of Historic Places in 1975 and was purchased by the state two years later. In 1981, the Utah State Historical Society moved into the building and to this day, the old depot houses its many offices and facilities. It also houses a couple of ghost stories! Since the 1940s, sightings of what has been dubbed the Purple Lady have been reported at the depot, most often near the current cafe and mezzanine areas. Legend tells that this lady was accompanying her fiance to the depot to see him off during his enlistment in either the First or Second World War. The two allegedly got into an argument, breaking off their engagement, and a ring was flung or fell onto the tracks. As the young lady went to retrieve the ring, she was struck and killed by an incoming train. The most detailed sighting of the Purple Lady was recorded in 1992 by a staff member with the Utah State Historical Society. While in the women's restroom near the cafe, she noticed a woman with black hair, wearing a purple sequined dress, sitting on the couch in the lounge area. The woman apparently appeared very angry, and ran out of the bathroom before disappearing from view. Her footsteps have also been reported throughout the northern section of the building. The Purple Lady is not alone, however. Another ghost is reported as being a man who was killed during the construction of a nearby train tunnel. While it is not usually noted how this particular ghost makes its presence known, he is dubbed the Tunnel Ghost. All Aboard! Rio Grande Depot Turns 100 This Year!